Snow snow and more snow. Oh and another polar vortex. That’s the theme for winter this year. It’s not much fun but it really is the perfect weather to stay at home and bake this Ina Garten peanut butter glob cookie recipe. It takes some willpower but you *can* halve a peanut butter glob recipe and make 10 cookies instead of 20 cookies. I’ve made it even easier by halving all the ingredients including some of the trickier ones. So you have no excuse! Even 10 cookies between two people feels like a bit much. 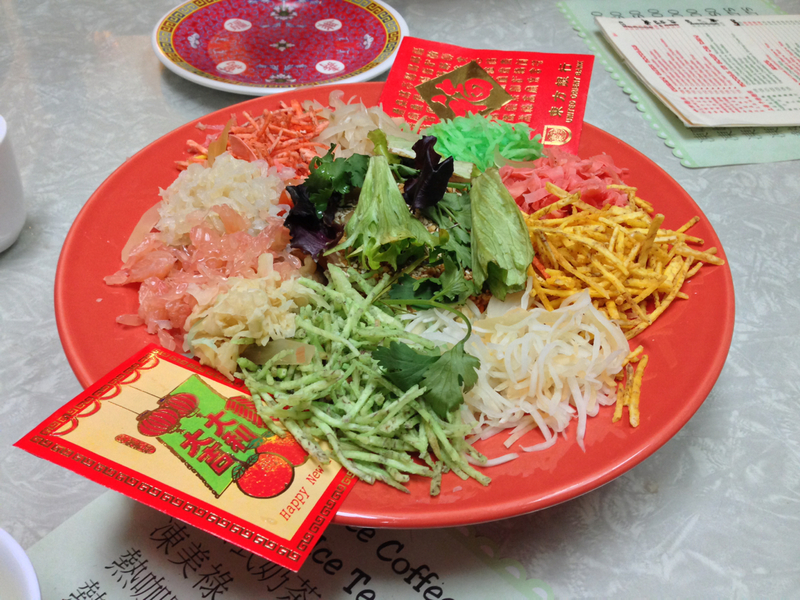 Which is why we gave some cookies away to friends after doing some Chinese New Year Yu Sheng tossing of salads. By the way these globs are delicious. I’m always a bit hesitant when a recipe calls for the addition of coffee but I think it really works with this recipe. The combination of chocolate, two types of nuts and peanut butter chips is pretty impressive. Ina has certainly got a winning recipe on her hands here.